Article via Forces Network: Al J Venter, author of Nuclear Terror, gives a snapshot of the very real threat posed by RDDs – Radiological Dispersion Devices. 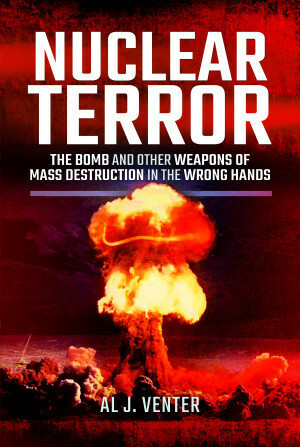 You'll be £25.00 closer to your next £10.00 credit when you purchase Nuclear Terror. What's this? These are frightening times for us all: Sarin nerve gas being sprayed on innocent civilians in Syria, threats that biological warfare agents might be spread about on the New York Subway and the most terrifying of all, three dirty bomb attacks thwarted in Russia. The reality of all these developments is that the environment in which we live today is being seriously threatened by the calculated use of weapons of mass destruction, and from a variety of dissident sources. Many rogue nations have attempted to build the bomb, an enormously complex task. So far only Pakistan and North Korea have succeeded, with Iran right now on the cusp of making that breakthrough. South Africa built six atom bombs in the 1970/1980s but with British, American and help from the International Atomic Energy Agency dismantled both the weapons and the entire programme shortly before Nelson Mandela came to power. In Nuclear Terror, Venter assesses the developments over the past 10 years of different countries in their attempts to build a nuclear programme. Not inflammatory, or scaremongering, Venter takes an objective stance in chronicling these recent developments overseas and adds another valuable contribution to this conversation. Although this volume is of the ‘Learned Tome’ genre, and is consequently likely to appeal to readers of a more academic persuasion, it is well-written and quite readable.